To pass the time, hacker Brandon Wilson - who normally messes around with graphics calculators - decided a few months back he'd take a look under the hood of Activision's Skylanders action figures, see what makes them tick. After playing around with the figure's RFID bases, he collected his research and stored it in a .zip file on his personal website. And thought nothing of it. Then one day Wilson comes home from work to find someone waiting at his door to hand him a legal notice from Activision, accusing him of all kinds of nefarious hacking deeds and demanding he take down all his work at once. Wilson claims that the majority of accusations levelled against him by Activision are completely inaccurate. 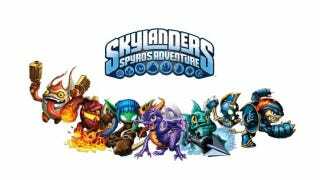 Many of them allege he is reverse-engineering the Skylanders RFID code, is working with others to hack the game, and collaborating those efforts on a messageboard. He reckons Activision's lawyers seem to be unable to tell the difference between the original creator of a thread, who makes the boasts that have attracted their attention, and Wilson, who leaves a single message and says nothing of hacking or reverse-engineering. You can read Activision's letter here, while Wilson has made his response public here.